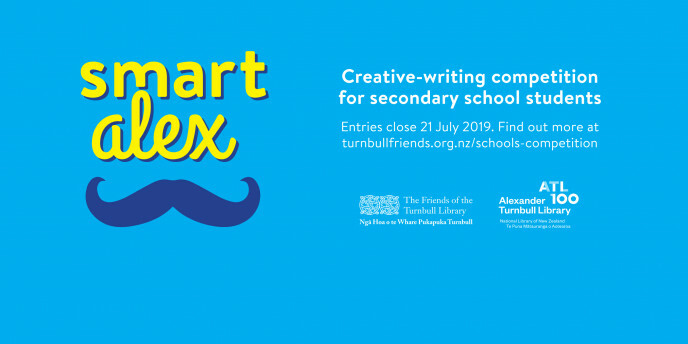 For a second year, the Friends of the Turnbull Library are running the Smart Alex creative writing competition. The aim is to celebrate the centenary of Alexander Turnbull and his remarkable legacy. Entries can be in English or te reo Māori. This year’s theme is Tuia Encounters 250, which acknowledges 250 years since the beginning of sustained onshore meetings between Māori and Europeans in Aotearoa New Zealand. The competition invites creative responses that explore themes of cross-cultural encounters, dual heritage/shared future, whakapapa, and identity. Y11–13 — the winner receives $800 cash and the runner-up receives $400 cash. The winner's school library receives a $150 book token. As well, up to 12 students with highly commended entries will receive a certificate and a $50 book token. The competition opened 4 March, and final entries must be received no later than 5pm, Sunday 21 July. Winners and highly commended entries will be announced Thursday 19 September. The official entry form and competition details are available on the Friends of the Turnbull Library website. The National Library Services to Schools website has posters to download to help promote the competition, along with tips for finding images, and ideas to help kick-start your students’ creativity. Aotearoa Youth Declaration 2019, a four-day conference run in April each year at the University of Auckland for high school-aged rangatahi (youth aged 13-18) from around Aotearoa who want to make a difference. It is a great opportunity for passionate rangatahi to meet other like-minded rangatahi and challenge themselves. At the conference, rangatahi work in groups (Rōpū) with trained facilitators to develop solutions to problems around specific topics, such as climate action, gender equality, international relations, or heritage. For further information please contact isabella.francis@unyouth.org.nz.